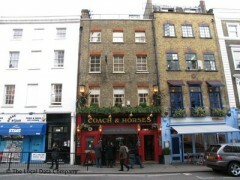 About: Coach & Horses serve a selection of alcoholic and soft drinks. Bar food is also available including roast beef. Background music serves as an accompaniment and they also have a TV.